Has dell made the grade in the channel? While working at EqualLogic, about 2 months before the Dell deal was finalized (and I was to become a Dell'er) I was at a conference where solution providers were giving vendors feedback. There stood a very articulate solution provider who had just given the audience some great feedback on what works and what doesn't when it comes to communications, rebates, margins, and incentives. "And one more thing", he added enthusiastically. "I don't care what they do, I'm NEVER doing business with the four-letter word in channel!" A gave a little chuckle with the rest of the vendors in the room, then it hit me. Wait! He was talking about me! I was going to be Dell, I was going to be the FOUR-LETTER WORD IN CHANNEL! Over the next 8 months I watched Dell flounder and put forth a very strong channel program. But had the damage already been done? Could Dell dig themselves out of the hole? Well what do you think? Has Dell made progress? Would love to hear from solution providers. What is a Channel Master? In December of 2007 I took part in IPED's channel masters program and was very impressed with it. They get a great group of channel professionals together and put you through a boot camp of sorts until you are beaten up, sweating, limping, and crying in some cases. At the end of the 3-days however you are a better channel professional. As channel professionals we can fall into the trap of sitting in our bubble while creating our programs and not keeping tabs on how our solution providers needs are changing. IPED slaps you with some cold hard reality around the developments in channel programs and what we need to do to become and stay competitive. Did you know that solution providers have a choice whether to sell you or sell someone else? Some vendors don't act like that is a reality. Surrounded by Directors of Channel from SAP, NetApp (I was at EqualLogic at the time so that was funny), EMC, Oracle, Panasonic, HDS, and others; it was nice to see we ALL had something to learn. IPED even brought in solution providers to tell us how they really feel, whether or not we were prepared to hear it. After the three days there are once a month webinars that you participate in to keep the conversation going. I had some great connections and have kept in touch with some in my group to continue the channel banter. Regardless of how much you think you already know, you can definitely learn something. Who knows, maybe you do know it all and you should go just to teach the others. With vendors vying for the attention and mind share of their channel partners incentive programs have become a standard in most channel programs. While I believe that a channel partner would not decide whether or not to do business with a vendor based on an incentive program, it may come into play on a deal by deal basis. In other words, if a solution provider is a certified Dell partner and a certified EMC partner and their customer is looking for storage, both are identical in capability and price, an incentive program may push the solution provider to lead with one or the other. Some vendors have very structured program such as EMC's Journey to the Top where you get points that can be turned in for merchandise such as flat screen tv's or a mountain bike, others have a less traditional approach on a deal by deal basis....we like to call that more margin. I understand the benefit to points in that you can get partners more deeply engaged and put some cheerleading behind the program "you're only 100 points away from X". Also, individuals are more likely to brag about getting 400 points then they are about $1000. But Cash is King right? Which incentive programs do you think deal with this right and which need help? Is it worthwhile to do an incentive program or do the deal by deal negotiations suffice? Anyone who has even sat in on a business school seminar has heard about the 5 Forces, 3 M's, 5 P's, SWOT, or 4 Q's more than enough times (I made the Q one up by the way) so why can't the channel have one? This is the 3 P's of Channel Management; Product, Program, Price. If you don't have a good product, no one will want to buy it. If no one wants to buy it you can bet no one will want to sell it! I know what you're thinking. As a channel manager or marketer you have little to no control over the product. What you do have is feedback from the solution providers and customers. You should do everything you can to get that feedback to the right people. If you don't have a good product and you've done everything you can do, maybe you should think about moving on. Product being equal, with your competitors the next thing solution providers are going to look at is your program. Do you charge an arm and a leg for training? Are your requirements realistic and do the benefits fit? How easy is it to get business for your product? Do you assist with marketing efforts? Are your solution providers going to be competing with your direct sales staff for the same opportunities? I bet you thought price was going to be first. Not so. Don't get me wrong if your margins are a fraction of your competing vendors you're going to lose but if your margins are reasonable your solution providers care more about being able to sell your product. It also depends on your place in the market. If you have 25% market share and customers are asking for you and nobody else but you (thanks to your product, see 2nd paragraph) then you can give less of a margin. However if you are at 8% market share and seeing the same 5 competitors in every sales call your partners are making there should be more of a benefit to those solution providers. Where does your company stack up? Solution Providers do you have any input? Are you at Xchange 2009 in New Orleans? If so I'd love to hear all about it! Comment back here or email me directly and post a "guest review" of the show, the products, or the speakers. Check out their list of top products to see. I hope some people take part in the Habitat for Humanity rebuilding project on the 11th in New Orleans. Please send notes, comments, and pictures! 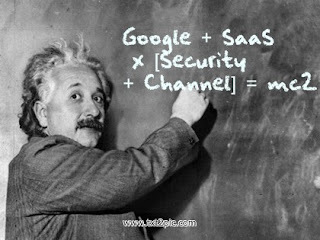 Is SaaS Channel an oxymoron? In my last position I was working for a SaaS vendor that has a legacy premise based product being sold through the channel. As our SaaS business picked up the channel was going to being selling that product as well. Stepping away from this business I needed to take a look at how a SaaS based channel product differed from a premise based software or hardware for that matter. Biggest difference? MARGIN. To sell something that has a one time cost of $1M is very different then selling something that has a lifetime cash value of $1M. How do you incent your partners? How are they compensated? There's not much out there about this. When searching on google the most recent document I found is from 2006. Anyone have more information or is doing this right now? Are you a fair weather VAR/Solution Provider? Do you belong to more partner programs then you have sales people? Do you sign up to become a partner simply because your customer wants to buy that vendor's product? Do you sign up for vendor programs then never complete the requirements? With all of the vendors and products to choose from no one could really blame you, but is it truly benefiting your business? The best way to get the most out of a channel program is to commit to the requirements and position yourself as the "authority" on that product or solution. So why then do so many solution providers spread themselves too thin? Should vendors have a referral program instead so the solution providers with customers ready to buy don't have to act like they are going to commit to the program? Channel Programs, one size does NOT fit all! Most channel programs have tiers they put their partners in. Gold, Platinum, and Diamond or Professional, Advanced, and Super-duper Advanced. Whatever you call it, just because you have neat little tiers that your solution providers fit into that does not mean those partners all need the same support whether financial, technical, or sales/marketing related. You've tiered these companies most likely based upon how much revenue they bring you, how many events they attend, whether or not they've bought a demo unit, and how many certified professionals they have with you. Does that mean you wouldn't give top tiering to a solution provider who has brought you $10M in revenue, has 20 certified professionals, and attends an event a month just because they won't buy a demo unit? It had better not or you are SO missing the point. Solution Providers want a tier that fits THEIR business not yours and as the channel evolves vendors need to start realizing that they need to cater more to their Solution Providers. How are your tiers set up? Do you take your partners' business models into account?